Mark McCarthy is a Managing Director at Ascension Finance. He has over 30 years of experience in ship finance and has been involved in total loan and lease exposures of more than US$5 billion on 500+ vessels. Before joining Ascension, Mark was Head of Shipping at Santander UK (previously Alliance & Leicester Commercial Finance) and oversaw unwinding of the $3.5 billion portfolio that he and the team had originally created. As well as establishing the ship finance team and portfolio at Alliance & Leicester, Mark has handled debt restructurings, maritime security enforcement and restructuring of UK tax leases. 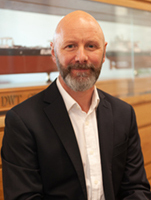 Before Alliance & Leicester Mark had various roles across the ship-finance industry, beginning at Royal Bank of Scotland. In the early 1990's, Mark took over responsibility for the ship lending book at Berliner Bank's London. Mark was then a ship finance consultant at a specialist firm and later with Seascope Capital.